Two William IV Carvers. Good general condition with brown seat covering. A nice pair of early Victorian matching mahogany carver chairs with bar backs carved cross rail drop in seats and tulip legs. 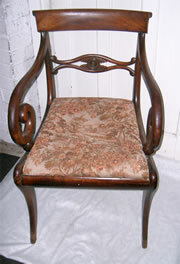 A Will IV Mahogany carver with scroll arms stuffover seat and well carved back in excellent condition. 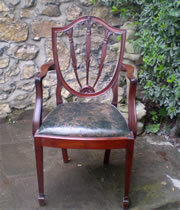 There are also two single matching chairs which can be sold with the carver. 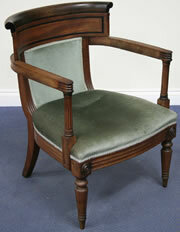 I require a mahogany carver chair to match the one in the photo and non carvers if available. 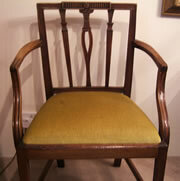 A very good Regency mahogany carver chair with nice cross rail scroll arms drop in seat and sabre front legs. 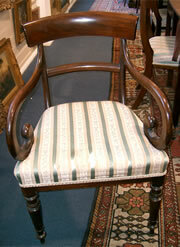 A fantastic quality matching pair of late Regency / William 4th mahogany carver chairs with scroll arms drop in seats and fluted legs covered in turquoise fabric.Both these chairs are in excellent condition. I also have a very similar pair of single chairs. Wanted: Vertical wooden, carved backs 3 bars . Vertical wooden, carved backs - 3 bars . 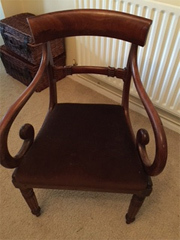 I am looking for a armchair similar to this one.